If you are a big fan of snorkeling you will certainly want to make Puerto Rico one of the hot spots that you choose to visit. You will find that Puerto Rico just may be the best place that you have ever chosen to enjoy snorkeling. No matter where you may have enjoyed snorkeling in the past, Puerto Rico can exceed your expectations as well as your past experiences. One of the top spots off the west coast of Puerto Rico is Mona Island, known for its pristine reefs that are home to a wide variety of marine life including rainbow colored fish, octopuses, moray eels, turtles, sting rays, clownfish and even puffers. This area houses one of the largest groups of reef fish life that Puerto Rico has to offer. You will want to make sure that you bring all of your snorkeling equipment with you when you visit Mona Island, as there are no snorkeling or diving equipment rentals in this area. In southwest Puerto Rico, you will find that La Paguera offers many reefs surrounding the offshore cays. You’ll be able to rent a boat that will drop you off at your location point and pick you back up at the time that you have prearranged. You can satisfy your snorkeling hunger with a view of all of the beautiful underwater life that calls the cays and reefs their home. This location is on the eastern coast of Puerto Rico and has the clearest waters along the beachfront, making it a number one spot for snorkeling. The Seven Seas public beach makes a great spot as all of the great snorkeling spots can be found in this area and are within walking distance from each other. You’ll be able to treat yourself to a spectacular snorkeling experience. Located off of the coast of Ponce is the island of Caja de Muertos which is uninhabited. Here you will find several outing services that will take you to the remote spots that they offer for a full day of snorkeling that allows you to enjoy the underwater world at its finest. Located in Lajas, this snorkeling haven offers numerous keys and the chance to see millions of species of marine wildlife, including dolphins and barracudas. 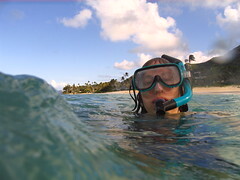 The waters here are about 40 feet deep and crystal clear, which makes it an excellent location for snorkeling. You will also be able to take advantage of all of the equipment rentals that you will need, as well as boat rentals. Le Parguera offers great lodging, as well as great dining experiences, for your adventure too. When you are ready to treat yourself to an awesome snorkeling experience, let Puerto Rico be your place of choice so that you are able to enjoy all of the supreme places that it has to offer for a quality snorkeling event. Book your trip now, so that you are able to take advantage of all that Puerto Rico has to offer. Justin Epley is an avid blogger with extensive experience as a travel consultant. He often sees travelers get into trouble overseas because of lack of correct information. He enjoys sharing his insights on various blogs. Click here for more travel insurance information.